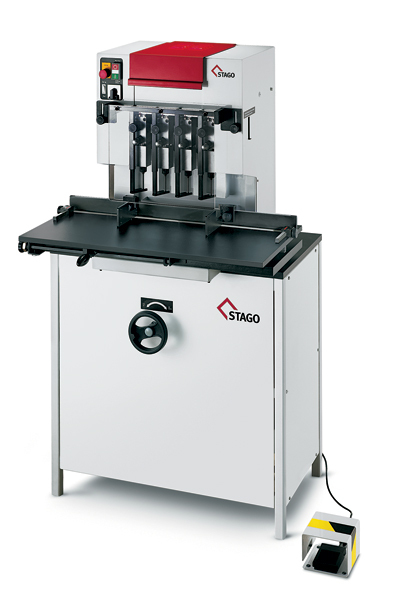 Because of the model construction, all of the STAGO – Paper Drilling Machines are ideal to be arranged for your range of use. So in every series there are different versions available: with up to five spindles, with attached table or adjustable table for a paper size up to DIN A3. Contact us! The hole spacing can be adjusted within the range of 40-250 mm. The large dimensions of the support table variants sets the standard in the professional environment. The ergonomic design enables effortless operation and high productivity. The spindle stroke is done either manually by a foot peddle or automatically by a footswitch and motor drive. The increased machine frame, the high-precision guides and maintenance-free drives guarantee a long machine life. For extreme applications with high heat generation, the optional drill cooling and lubrication ensures a perfect drilling result. Further models and special designs on your request. Contact us! Equipment for Paper Drilling Machines STAGO original equipment made in Germany Delivery of replacements just in time We deliver original replacements just in time!